Britain's Zoe Gillings was "shocked and delighted" to finish on the podium at the European Cup snowboard cross competition in Italy. The Isle of Man athlete won both her quarter and semi-finals to reach the final despite an 11-month absence from the snow since the Winter Olympics. 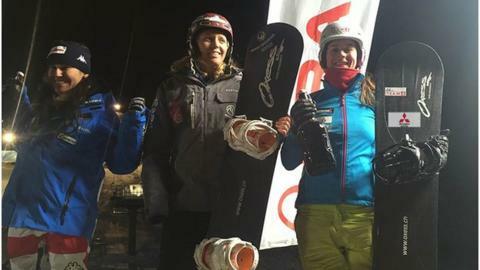 France's Charlotte Bankes won the event in Cortina D'Ampezzo ahead of Italian Raffaella Brutto, with Gillings third. "I'm really happy with the result, it was a real shock," she said. Gillings only returned to the snow a fortnight ago after almost 12 months away from the sport following her ninth-place finish at the Sochi Games. The 29-year-old said: "It was a strong field and despite not being on snow for just under a year and not doing any snowboard cross training whatsoever, I was really happy with my performance." Gillings is aiming to compete in her fourth Olympics at Pyeongchang in South Korea in 2018.